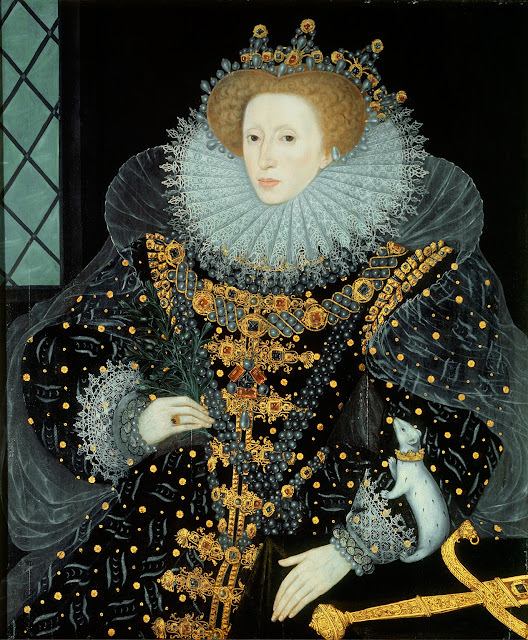 I wonder what Elizabeth I would think of this medical device being named after her and her fashionable ruff? It certainly looks like you wouldn't be able to scratch yourself while wearing Elizabeth's stylish neck adornment. But I guess that is the whole point of a pet E-collar after all - to stop your pet from scratching at wounds while healing. 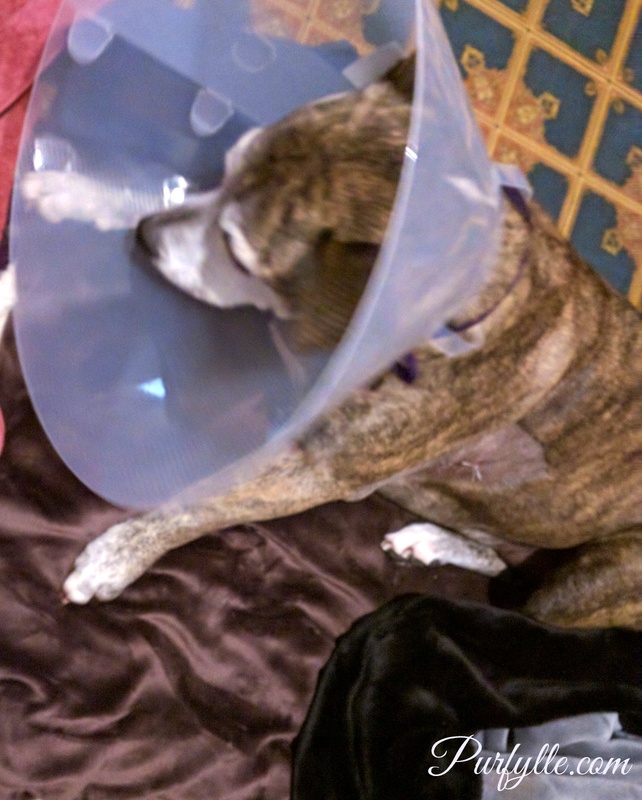 It's been a very long week this week as Geri The Wonder Dog had to have a lump removed from a most awkward location, her 'armpit' (or whatever you call that area on a dog). I've been ensuring she is comfortable and her needs are met while she recovers. While she was drowsy from the operation we didn't need to worry too much about Geri disturbing her stitches, however the wonderful team at the Swan Veterinary Hospital did bandage her rear paw just in case she started to scratch herself, I had to replace that bandage within hours of her returning home because she got it all wet. 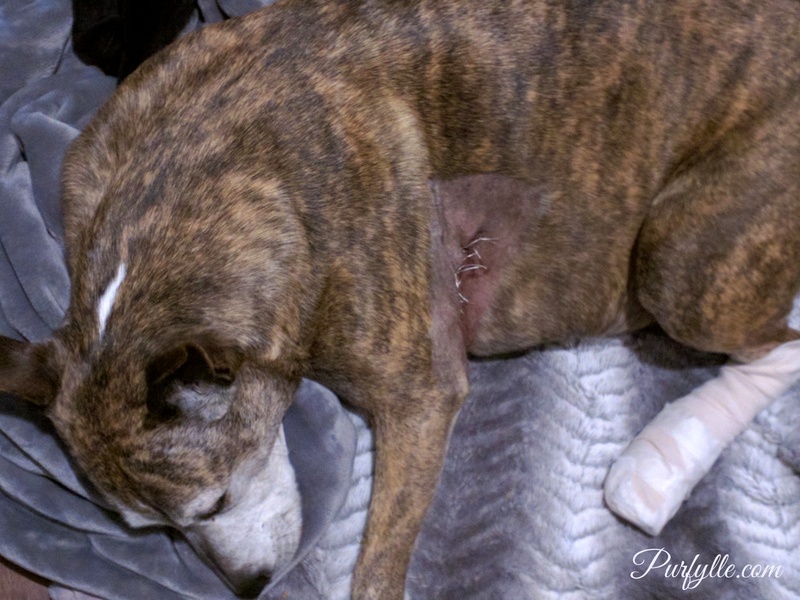 Geri had a hard time for the first 24 hours after surgery and after phoning the clinic we decided to increase her pain meds for a short while, but it wasn't long before she was feeling perky enough to start licking at her stitches. Sorry the photo is a bit fuzzy but Geri wouldn't sit still with that bucket on her head. She started to paw at it immediately and I was beginning to worry she would rip her stitches. 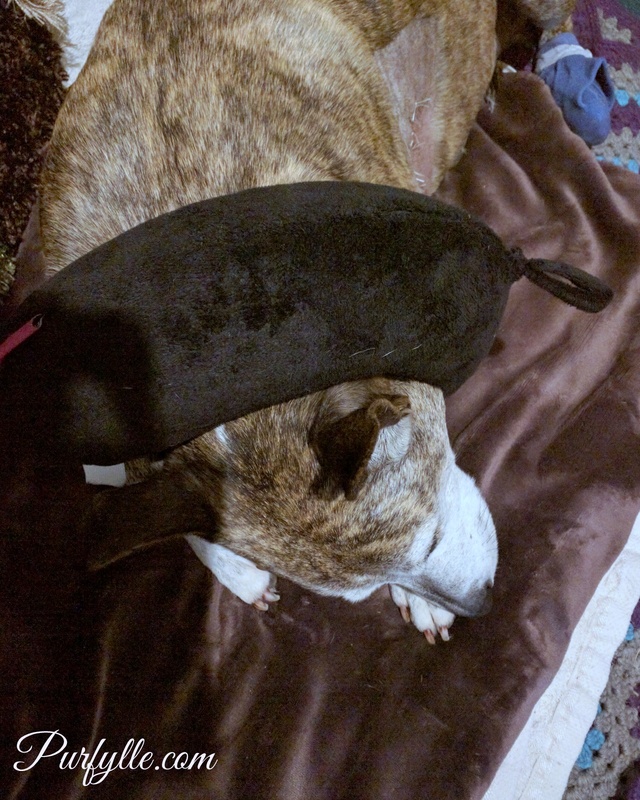 Before she went in for her surgery I had tried using a travel pillow with the ends joined by a strip of elastic to stop her from licking at the horrid lump. Geri hated the pillow at the time and it was not 100% effective but it did help. If the cushion turned around to the section where I'd added the elastic she could by-pass the pillow and have a lick, however as long as I kept a bit of an eye on her I could reposition the pillow as necessary. Switching the E-collar for the cushion was very welcome and it's even more effective while she is a bit drowsy from her pain medication, she even sat still long enough for me to take a photo. The pillow is also much more comfortable to sleep with and we've had good success in keeping it on her head. I take it off for meals just to keep it clean but she can eat and drink while wearing it without any problems at all. Keeping her foot bandage on, clean and dry is a completely different story though. 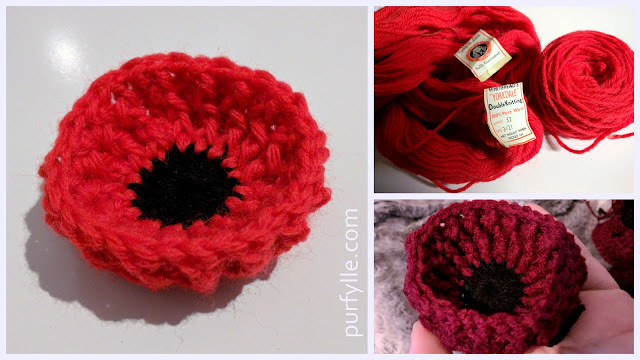 I did crochet some booties for her (pattern coming soon) but she lost the first one and she can get them off with a bit of persistence - Geri is the most persistent dog you've ever met - so I've given up on trying to use them for now. I know it's Friday and some of you may have been expecting a Finish It Friday post, but I just have been too busy looking after my furbaby. I thought I'd be able to sit down and get in some good crocheting and blog work done while she slept peacefully but every time I tried there seems to have been something that Geri needed attending to, from pats and reassurance to drinks, help to go outside, a new foot bandage or protection from being poked and prodded by a curious Freki. I'm sure Geri will be back to her adorable obnoxious self in no time. 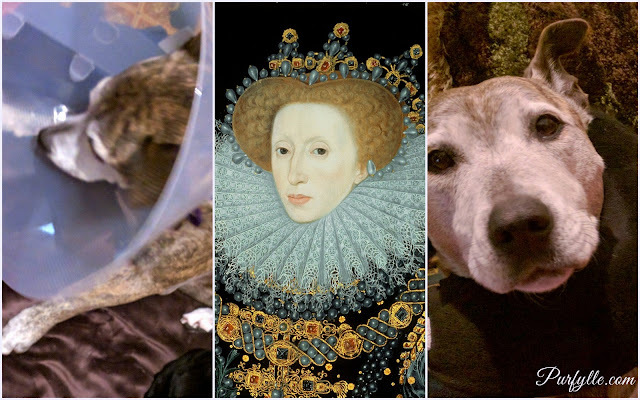 So tell me, have you ever had to use bucket-head on your pets? 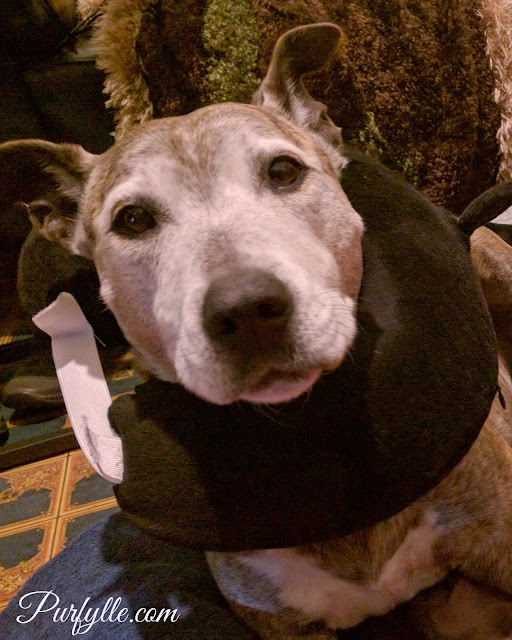 The vet didn't have a "bucket" big enough for my dog when he had a hematoma removed from his ear. The bandage they put on his foot didn't last long, either. It ended up being a horrid week where I just had to yell... and yell, and yell to get him to leave it alone. I felt so bad for him, and I wish I would have thought of something like this. I still wish Geri a speedy recovery, and you some rest! She looks so much more relaxed with that pillow. Maybe you'll get a chance to put your feet up before she's back at it and ready to play again. Even with her pillow head and her foot bandaged up there's been a bit of telling off. I've re-bandaged her foot repeatedly, (needs doing again, she's been outside and I'm sure it's wet). What I've been using is the super cheap - and therefore bulky and padded, which is the important feature - sanitary napkins, placed on top of her foot wrapping forwards (not around) over her claws and then under her foot, then taped in place. I expose the sticky side and then bandage up - the stickiness helps to keep the bandage secure. 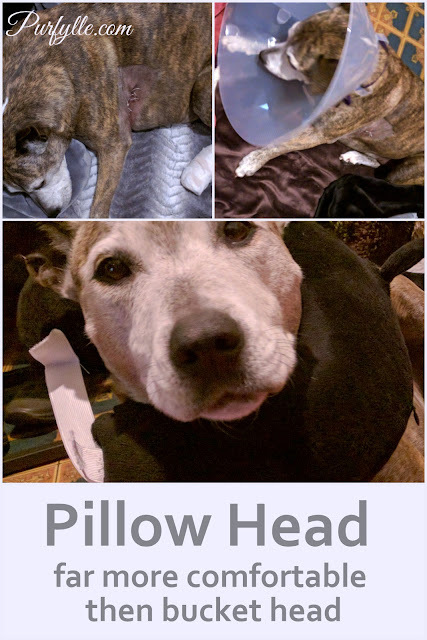 In the top photo of her sleeping I've used a normal bandage but in the bottom photo of her sleeping I've used a knee high sock, wrapping it as a bandage and then taking the last section of sock and pulling it over her foot - well like a sock, then securing everything with more tape. Not sure if this description makes sense. But I wish I had thought of both of these years ago when she was sterilised. You're a good doggy mum! She would not agree with you on that at the moment, I keep subjecting her to indignities like foot bandages and pillow head. Hope Geri feels better and is up and about in no time. How did Elizabeth manage to wear that horrible thing? Geri is already almost back to her usual self. It's amazing how fast dogs heal. So far Lizzy managed to wear it, I think it must help to have a host of people following you around to do your every bidding.